In an increasingly liberal world, we're as liberal with our space as we are with anything else! According to our Houzz UK Kitchen Survey, open-plan kitchens are one of the most popular choices for kitchen layouts, and there's no surprise as to why - they're spacious, modern and practical. But does the open-plan kitchen get your vote, or do you prefer something else? Vote and leave us a comment! We love open plan kitchens! The concept of an open planned kitchen is great , but to make it work you have to be meticulously tidy , they can become cluttered very quickly in day to use . When planned well they are amazing !!! Creating space for families to be together but doing there own thing highly important! It's the future of kitchen use! A Living / Kitchen. I'm in love with mine. Open plan kitchens or 'living spaces' as we tend to call them now, have been popular and evolving for the last 15 years or so, and have become one of the most called-for requests. They should however, be thoughtfully designed and not just mindlessly created. Sometimes the resultant space doesn't quite accommodate what the occupant thought it would; or an extension is built and opened through to the original home but the eventual contents ignored. There's nothing more upsetting, than to explain to a client who's half way through building an extension, that the island they craved, won't in fact fit the newly created space! We specialise in kitchen design and remodeling, so tend to design from the clients needs outwards. This sometimes proves an extension isn't justified, or often serves to optimise the size & shape of an extension to suit the internal flow & accommodation. I love open plan kitchen/dining/snug spaces but personally feel that a separate lounge or TV room is better if possible, than to have an entirely knocked through everything. Eventually the combination of beeping appliances, extractors and two sources of entertainment, can get irritating! If space allows, I would always recommend a separate utility room to keep the noisiest machines well away from living accommodation. Whatever you choose, make sure that plenty of thought and time is invested in the design process, before building or knocking through! 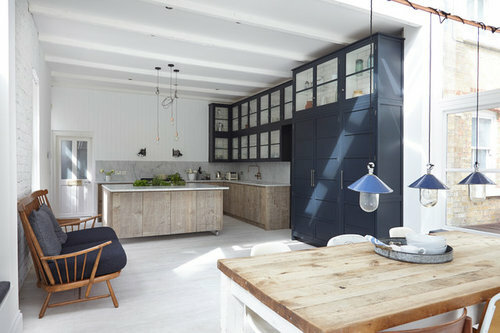 love the idea of an open plan kitchen especially in a small, confined spaces! 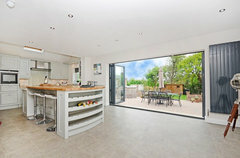 I love open plan kitchens, particularly for families, they create fabulous spaces to congregate and socialise. Yay, however square foot available space will determine how it looks. Open plan kitchens are great, personally like a lot of curves and creating different work stations on the kitchen island itself. 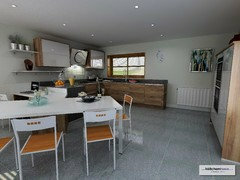 Open plan kitchens are definitely more family friendly and are the way forward. We mainly install open plan. Its great if you have a young family or spend most of your time watching the inside of your fridge. 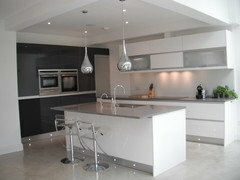 Recently completed an open plan kitchen, great for socialising . i love the fact that the whole family can be together. I had one in my old house and we are doing another in our new one! Our clients are finding open plan kitchens are giving them more space in our luxury apartments. Love an open plan kitchen, creates a great feeling of space! Open plan kitchens are great family spaces, and really open up your home. Provided that you get the design, heating and light sorted out they are the best way to go. Especially in a new extension. Love open plan kitchens, however sometimes it is great to be able to 'shut the door' on the mess. Open plan kitchens can maximise space and serve more than one purpose becoming a true heart of a house. 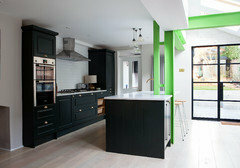 I designed and installed this wonderful handmade kitchen, open plan is defiantly the way forward. I prefer that clients, particularly developers, prefer open plan kitchen. Louise - Studio Gabrielle. It's all depends on the situation and design. Open plan kitchens are great! The more light the better. Open plan kitchens are ideal for a modern family home. 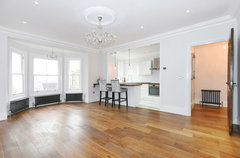 Yah to open plan family orientated spaces with lots of light and laughter. 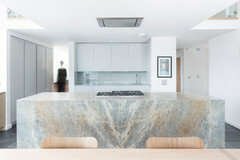 We are often approached by clients who are creating an open plan kitchen, dining and living area. To overcome some of the issues we make cabinetry which can hide away the usual clutter found in a busy kitchen. Bi-fold and pocketing doors are great in this instance as ovens and even sinks can be hidden away, making the cabinetry seem more like a piece of furniture than a kitchen. Our clients love being able to change the look of a space in an instance! It is crucial to make sure you choose your appliances carefully, i.e. a quiet dishwasher and a good extractor are of huge benefit here. As long as the space is thoughtfully planned there is no reason that it shouldn't work functional and aesthetically. 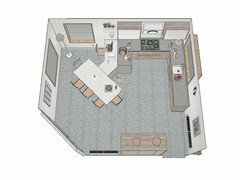 We have just created a open plan living dining kitchen. Its fabulous and I love the fact that I am not isolated from everyone. We have made a utility cupboard away from the open plan space for the washer and dryer and we also have a seperate room which is a quiet sitting room for days you may want to be alone to read or study. I love it and find it to be the best way to live where everyone remains involved with each other. POLL: TV in the bedroom - yay or nay? POLL: Fake flowers - yay or nay? POLL: Open plan bathrooms - yay or nay? Handle-less kitchen units- yay or nay? POLL: See-through bathroom - yay or nay?